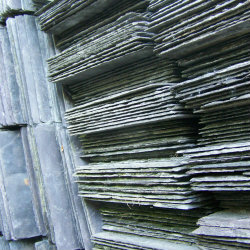 We have a wide range of reclaimed slate and tiles at Ashbrook Roofing. These materials are suitable for making roof repairs to period properties or matching roof extensions to existing structures. Reclaimed materials also offer a unique alternative to new roof slates and add a charming weathered look to a new construction project. Did you know that we stock a comprehensive selection of roofing supplies? Order your reclaimed slates and tiles online and you can purchase the rest of your essential materials through our website. We’ll even offer next day delivery, if you place your order before 2pm. We have more than 30 years’ experience of working in the roofing and construction industry. During that time, we’ve built up a wealth of knowledge and expertise, which we’re happy to share. Contact us for free and impartial advice about your building project or product support, or to begin sourcing reclaimed slates and tiles.